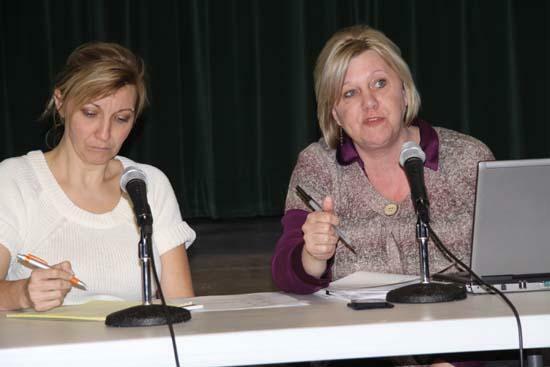 Middle School Study Group members Kim Parsley, left, principal of Woodland School, and Lisa Black, director of transportation, listen and take notes during Monday's forum. Cannon County Schools officials were hoping to receive feedback from citizens when they scheduled a series of public forums to discuss the idea of adding a middle school to the county's grade structure. If the first forum held Monday night at Woodbury Grammar School is any indication, they will receive their wish before the seven forums are completed. Citizens peppered Director of Schools Barbara Parker and members of the Middle School Study Group with a wide range of questions on middle schools, and offered their suggestions and opinions on the subject. Parents, teachers, and teachers who are parents of students attending local schools, shared their views and concerns on the need for a middle school, how one would effect existing schools, whether a new school or schools should be built, the cost of maintaining and building schools, the possible loss of teaching and administrative positions, educational opportunities and student safety. The information discussed at the Cannon County Middle School Information Presentation will be presented by the Middle School Study Group to the Cannon County Board of Education after the forums are completed. It will then be up to the school board, and possible a public referendum, to decide how to proceed. The second forum will be held at East Side School next Monday, followed by one at Woodland School next Tuesday. 1. Aides in transition to high school. 2. Increase students' feeling of independence. 3. Opportunities for increased specialized classes. 4. Potential for more success in sports/Middle School teams sanctioned. 5. More extra curricular activities offered. 6. School is geared more toward adolescents. 8. Older students separated from younger students. 9. Can offer more intervention for behavior issues at this age. 10. More familiarity among students from across the county. 11. Combined resources for science labs, etc. 12. May increase high school graduation rate. Why Not A Middle School? 1. Most elementary schools in county have good to high achievement now. 2. Pupil/Teacher ratio in some classes will increase. 3. Some students may get "lost" or be too immature for larger environment. 4. Possibility for more issues with attendance and/or behavior. 5. Fewer students can participate in basketball at school level. 6. Athletes travel further to compete in sports. 7. Middle School may be less personal and community oriented. 8. Logistics: Cost, location, bussing, zoning. 9. Possible loss of some schools if new building option is chosen. 10. Increased transportation cost for county and time on bus for students. 11. May have less parent involvement at the elementary level. 12. Fear of the unknown by students and parents. A series of ideas was also presented by the Study Group for consideration as to the eventual outcome of the Middle School discussions. • No change (to the current grade structure). • Convert one (elementary) school into a middle school and bus K-5 to other remaining schools. • Build a new Middle School. • Add a Middle annex to Woodbury Grammar School. • Turn High School into Middle School and build a new High School. • Turn Woodbury Grammar into Middle School and build a new Elementary School. • Add all 8th graders to Woodbury Grammar School as a transition to High School program and eventually add 6th and 7th. Parker said the forums are a fact-finding mission for the school system. "They are an open discussion of the idea of a middle school. No decisions will be made tonight," Parker said. "We know there are issues or ideas that will come up that we won't have the answers to at this time, but we will try to get them." The Study Group consists of Parker, school board members Shannon Davenport and Chris Blackburn, principals Kim Parsley, Karen King and Robert Sain, transportation director Lisa Black and supervisor of instruction Marcia Melton. In addition to Davenport and Blackburn, school board members Randy Gannon, Cathy Hyatt and Mike Mayfield also attended Monday's forum. At this time a middle school would NOT be a good idea. Most people in our county are struggling due to the economy. Even the federal government is cutting back. Do not think it would be productive to the citizen of CC to have taxes raised at this time. Its hard to pay the taxes now and the majority of the burden will go to landowners by way of increasing property taxes. One question! Where's the money coming from?? As a family, we have to be on a budget and not spend money freely we don't have. It seems this doesn't apply to county government and the school board. The middle school is not a necessity. The county needs to live within their means. When the economy rebounds and our county starts growing, this is an issue that needs to be addressed then, not now! in my childs class there are 14 to 15 students. ive heard from several other parents in other schools and it is about the same.so why build,orrent,or move 5 grades around to confuss them more.and i am with cedric this county is having hard times.why go spending money we dont have.i live on a very tight budget and really cant afford to pay higher land taxes.i thought what was added to the vehicle tags 30 years ago was going to be taken off when the high school was paid for.i dont see it happening.and if we keep raising property taxes people of this county will start selling. out then what?thats why we dont have more people moving into this county. So the idea is to build build build? Let's create and spend more? A middle school seems an odd choice to focus on as a means of educational improvement. This is not critical for a good education. Here are some facts for all of you who are so concerned about money. Maybe this will help you understand where your money is going right now. I was at last night's meeting and we were told that the county has a 14.2 million school budget each year. Approximately $800,000 is spent on each school for the expenses they incur. This equals to roughly 5.6 million of the total $14.2 million spent each year. We were also told they were approximately $750,000 into the reserves they have saved. They are required to hold per the State of Tennessee 2% to 3% of their total budget and they are already dipping into that savings. Here is a breakdown of each school and the total enrollment and age of each school (not including additions that have been built on). Using the $800,000 spent on Eastside it works out to be $6,722.68 per student spent each year keeping the school open. Short Mountain is spending $5,479.45 per student each year keeping their doors open. Auburntown works out to be $5,633.80 per student to keep the doors open. So I have to ask all of you who don't believe a middle school needs to be built because it is not financially sound, do you think what we are currently doing is? Do you honestly think that dumping $800,000 PER YEAR into schools that are 50, 53 and 56 years old is good sense? Do you honestly think these students are getting five or six thousand dollar educations each year? I know this is not popular and I mean no offense to any of the older schools, but building a middle school and closing the other four would save $3.2 million dollars a year toward paying the new school off. And Jeff a middle school allows for a school to have a science lab or a drama club, it allows teachers to teach one subject versus five or six, it allows students to adjust to the social aspects of a bigger school, etc. So I disagree with you, I believe it is critical for a good education. At what point do we stop living in the past and start thinking about tomorrow? Prior to stating that you do not want your children to ride a bus to here or there, what about all the other children in the county that ride buses? Some are picked up at 6:30 am and do not arrive home until 3:40 pm. As far as class size, a middle school will provide a much broader education than a grammar school can provide. This coming from a parent who attended a middle school which had computer labs, science labs in which we did experiments, math labs, gym every day and a choice of classes between band, choir, etc. As for sports, which is more important sports which probably not even .5% of former Cannon County sports players have even gone on to college or the majors for sports. When did extra-curricular activities become the most important in our childrens education. All you hear about in this county is sports..what about the children who go to school, learn, and keep a great grade point average? This middle school is needed and the people will have a large voice in this process. If a Middle School is decided upon, I would think it should have a central location, just as the high school does. Otherwise, I would think there would be quite the uproar if a decision was made to turn one of our county schools into a middle school. Can you imagine living in Auburntown and driving your middle school student to Woodland or Short Mountain? WOW! Corey, what is the breakdown of the other grammar schools in our county? Just wondering. What is the projected cost per student if a middle school is created at Woodbury Grammar? Also, are you suggesting to totally shut down East Side, Short Mountain, and Auburn? I took the $800,000 we were told last night that is spent on each school and divided it by the number of students enrolled. That gave me the value per student to keep the doors open for each school. The cost per student by building a middle school cannot be determined at this time because there has been no decision on what grades would actually be enrolled. For example it could be more or less depending if it is a middle school built for K thru 5 or if it is built for K thru 4. And to be honest, I don't have it all figured out. I don't claim to know it all or what everything will cost or how it will affect teacher’s jobs, re-zoning, transportation, etc. That is more for the school board, the middle school committee and the Cannon County Commissioners. And, I am not sure we could even close all of the schools because we have more K-5 students than we could currently hold inside of one school. But, we will be able to close some of them, as we should have done years ago. And that will be the right thing to do and one that will save money over time. All I know for certain is if we wait, it will cost us more in the long run. I said the same thing 10 years ago when we went through this same process and I was right then and I will be right again if we don't build now. If we wait we will be sinking almost a million dollars a year into schools that are 56 years old. If we wait, we pass this problem along to the students in school now who will be sitting on the school board 10 years from now. I absolutely mean no offense to any school, any individual or idea. I am simply trying to understand and prepare for something beyond today. I hope everyone respects that for what it is. And the kicker in all of this is that no matter what decision is made through these meetings, it will ultimately come down to the decision of the County Commissioners. If they decide they don't want to fund it, we won't get it. It will be a long process and I hope cooler heads will prevail. Sorry if I didn't answer all of your questions. Corey, weren't you the same one that told us last week when the first poll about the middle school came out that there were 2 or 3 elementary schools that had less than 100 students enrolled? Should have checked those figures! And richstrength750 shouldn't the fact that the smaller schools have higher TCAP test scores tell you something??? I found High school to be the most effective and satisfying venue for me both socially and educationally. My comment earlier concerning the cost of the whole process was fair and valid. Work harder to convince me please. What if someone on the edge of the county gave the schoolsystem free land to build a new high school on? WHAT THEN! Free land would be hard to turn down. The first four grades are for 2009; the second set for 2010 and the last four are the state average. Where does your school stand over the past two years? Going up/down or staying the same. Are you happy with these results? Interesting thought redmolly. Auburntown is on the edge of the county. Were free land offered to build a school there would Woodbury parents support busing their children over the hill every day to Auburntown? I based my figures of less than 100 students last week from what a teacher told me. I did however follow up with Barbara Parker to get the exact numbers of the enrollments for each school. Sorry, I was off by 16 in one instance, 38 in another and 42 in one more. So, if you can honestly say that spending $800,000 a year for a school with 116 students enrolled makes sense to you, then I don’t think I or anyone else will change your mind. And, if you read richstrength above he was stating the numbers for WGS only. Last week the numbers were posted from the same source he quotes about the schools that had fewer students and their numbers were almost identical. Your theory that less students per class makes smarter students is hogwash. Anyone who teaches a class or has students in a class of 26 to 30 should take great offense to your argument because you are basically saying that anyone in a large class has a dumb class. There is no proof of that whatsoever! None! And it is disrespectful to continue to say it. Jeff, right now we spend approximately $800,000 per school each year. Teachers have to teach a certain curriculum and students are not offered the same opportunities that a middle school would offer. For example: If we had teachers who taught math and math only, they could specialize and help students who are struggling and raise those test score. However, when you get one hour a day and the rest is spent on the other courses, then the results show up in the testing. There would be better science labs, more available courses; better facilities that are not 50 plus years old and we would spend less money each year on three or four schools vs. seven or eight. They would have art classes not currently offered. Special needs children would have better facilities, programs to integrate with the student population more frequently, etc. Notice I didn't say anything about sports, because I for one believe that to be toward the bottom of the list of positive reasons for building a new school. No offense intended toward anyone or any group, but no matter how it shakes out, if we don't plan for tomorrow we will surely pay for it later on. There are cons to building a middle school as well. I don’t want for one minute for anyone to think I don’t believe that or understand it. However, the good will outweigh the bad. if we built a middle school,wouldnt we still be paying the same amount to keep what schools we have now open? only differance i see is the tally per student that corey made will only go up cause they wont be as many students there and the buildings will be just as old and getting older and we will be paying for a maintance for a middle school too.not to say what it would cost to bus our kids to the middle school. Smokybear, I agree with you...even if a middle school is built there will still be students in at least some of the older schools. Corey, are you saying that it costs as much to operate Woodbury Grammar as it does East Side? Or did you take the entire bill for all the schools and divide by six? Where did you get these figures? And are teachers' salaries included in your numbers? Please research what experts have concluded regarding k-8 vs middle schools....do your research! Just google it! Many districts now regret changing to the middle school model...but at least they saved some money! Students' safety and quality of education will very likely be negatively affected if a middle school model is implemented in our county. Most middle schools in our country were created because they HAD to! We have a choice! I'd rather have my kids in a nurturing environment instead of getting lost in crowd in a middle school. Hey Blue what would the rest of the county want to do. Maybe Auburn or HollowSprings or Readyville or Reed Hollow . Sure would save some money . Who says it would have to be in the middle, what is wrong on the edge. I wonder if we are going to hear from any other board members. We know where Shannon D. stands, but we do not know where the others stand. Also, I think we might want to hear what some of the central office staff such as Mrs. Parker, Mrs. Melton, Mrs. Merriman, and other educated members think. Don't these people have higher education, expertise, and EXPERIENCE that might need to be heard?? I agree with scrabble, we need to look at the research. I'm hearing lots about saving money and lots about what is best for the kids. Sometimes they don't coincide. Ever heard of you get what you pay for? Maybe we would save money, but at the expense of our kids education. I wish someone would tell me otherwise, but I am thinking that our middle school would be just "thrown together". Are there going to be 30-35 kids per class? Are we really going to have extra classes taught by qualified teachers? Or are they just going to throw some classes together, add it to the teachers existing classes and responsibilities? Drama has been cut at the high school, so the middle school would have it? I think NOT! That would cost $! I'm still not convinced that sports is still not a big issue here. I find it hard to believe that every county surrounding Cannon County has a middle school or schools, yet there are those who believe that one here would be a disaster. Yes it is insightful to read studies of K-8 vs. middle schools, but I'd rather look at those that deal with rural middle schools vs. K-8 as opposed to urban schools. There is a big difference. Kevin, I don't think a middle school would be a disaster, but I don't think it's the best choice for the students. There's lots of research to support this. Also, I am a teacher. If our county decides to go the middle school route, I'll do all I can to help make the transition successful for all involved. That is, if I am allowed to keep my job. I believe strongly that we should build a new school. I have went back and forth a little on whether I think it should be a new High School, a middle school K-5 or if we should just annex onto the Woodbury Grammar School as was suggested during the meeting the other night. I don't have all the answers; I don't know all of the pros or cons. I just simply believe keeping six grammar schools open at a cost of approximately $800,000 per school each year is not a feasible solution to continue when four out of the six are over 50 years old and three have less than 150 students K thru 8. I think if everyone would look at it from that stand point first, you would also agree and see it from a different perspective. To me, building is the only option we have to accept. Once we get that idea into our collective minds then we can move forward. It is something we should have already prepared for many years ago. Unfortunately, on many different levels of our local government over the last few years it has remained one of those things that "if I don't talk about it, it doesn't really exist" kind of subjects. Well, it does exist. And it needs to be addressed now and not later. I have the upmost respect for our teachers and the job they do. I have the best interests in mind in all of this for all of our children (I have two currently in the school system). All I want out of this is a school system that provides our children with the same advantages other systems have, the best education possible in a school that wasn't built when my grandmother was a teenager and something that is more financially sound for our community. Does that seem so wrong to all of you? I hope it is what you desire as well. Do you believe that what we currently have is money well spent? Do you believe we should just walk away and not do anything? If your answer is NO to either of those questions then you and I are not very far apart in the way we think. I am open to all ideas with the exception of one and that is to not do anything. Kevin, I appreciate your intelligence and your ability to look at all sides of the issue! I will admit that as a county we face difficult challenges. Fiscal issues are prominent in these rough times, and when faced with such a financial responsibility, it is our nature to automatically wonder how the issue will affect our wallets. And rightly so! Any responsible citizen will do that. However, to negate the idea of a middle school based on negative perceptions of how children perform in a middle school setting, or to suggest they are better off in a smaller, more nurturing environment, or even to suggest that the transition is harmful tells me that some citizens are not very familiar with our Cannon County students. I am- I am with middle-schoolers every day, and I must tell you that they are amazing and LOVE to be challenged! We cannot let financial or emotional fear guide our choices. Change is hard, but I for one am open to fiscally responsible suggestions. Middle school years are some of the most pivotal and challenging, whether in an elementary or middle school setting. I have been employed in both. I work daily with teachers who are passionate and dedicated to making the most of our resources to give our students what they need- ESPECIALLY since receiving new, more rigorous state standards and new guidelines for high school students. All I want is success for my middle-schoolers; I am definitely not in this for the paycheck. I applaud our school board, Director of Schools, Central Office staff, parents, and community members for being willing to look at possibilites for our children and not maintain a tunnel vision. Whatever is decided, I feel confident that we can unite and make the best of the outcome. Our best assets- our students- will meet and exceed our expectations with the right guidance. Whether we stay as we are currently or a decision is made to implement a change in any way, I hope that we can send a positive message to our students- our future community leaders- that we have confidence in them and have their interests at heart. I would like to point out one more issue: many of the "facts" presented have many more aspects below the surface. Many 6-8 teachers in the smaller schools must teach multiple subjects, rather than focusing on a single discipline. This takes extreme intelligence and I think they deserve so much praise! And, to compare students from a smaller school to Woodbury Grammar students requires a different mindset, too; the Grammar school serves a different socio-economic group and has a very high transient rate. Ultimately, I am confident that our Cannon County culture- which I am so proud to support- will filter over into a middle school if we create one in the future. I work with some of the best kids and most supportive parents in the world, and I know that this is not limited by the boundaries of our individual communities within the city limits. well my child goes to DMS and does very well with class changes, i also have a child at Northside in Smithville although she is only in 3rd. they still switch classes for higher math/reading. I think this is a very good idea to keeping the childs mind engaged.. and self esteem of other who aren't at a higher level from being lowered more because they feel inadequate... but i have 1 big question what is to happen to all the elemterary school scattered across Cannon County, if you take 1/2 of the enrolled students to a middle school is there even a reason to have so many elementary school or would the county look into combining some of those as well? I would do that, but when I asked for the break down of the budget for each individual school I was told by Barbara there was no budget for each individual school. We were told they spent an average of $800,000 per school at the meeting on Monday night. That was told to everyone in the room by members of the school board. So, the only way I can get the cost per student is to average it based on the numbers I was given. I know that it is not totally accurate, but let's just say it costs $500,000 for the three smaller schools (which is $300,000 lower than what we were told). It still works out to be approximately $4201 per student at Eastside, $3521 at Auburntown and $3424 at Short Mountain. As you can see, it still a lot of money spent per student, even when I deduct $300,000 which I doubt very seriously could be done. Hey Corey I applaud your efforts for doing the math on all the schools. But you are not going to save very much money no matter how you look at it. I don't think you have factored in cost for busing students from the various locations throughout the county. Cannon County is not geographically set up to have a middle school. Busing will continue to keep the cost high even if you do close some schools. Right now most of the bus drivers that transport students to the county schools live in the community where the school is. If you centralize the middle school you will have buses coming from the outlying areas to the middle school, then back to there area, back to the middle school, and then back to the outlying area and then they run their routes on top of that. And buses will have to be on the road longer to transport students from communities that lose their schools to the communities that have them. And state law will only allow students to be on a bus a certain amount of time. Sounds like a few extra trips, and fuel is not getting any cheaper. I have been in every school in the county very recently, and even though they are old they are more structually sound then any new building you could build today. The schools have been maintained very well. The comment about smaller class sizes have better performing students, well there is some validity to that I hate to say. You need to attend some state education meetings and see what the "new" wave is in educating children today...smaller class sizes. I also hate to say it but education is based on test scores now. Studies do show that smaller class sizes produce better scores on assessments. School systems compared in size to Cannon County are performing feasibility studies on how to implement ways to try and reduce class sizes in their systems. One proposal is to look at going away from the middle school concept and school consolidation. Look at the state report card even for the county and see. It seems that the biggest school in the county had the lowest scores. Now, is that the fault of the teachers in that school...nope. They do the best they can with the numbers they have to work with. I would guess that Woodbury Grammar has a higher pupil teacher ratio then any other school in the county. I take it by your comments that you do not have teaching experience. If you walk into a classroom for a period of time you would change your mind about class sizes not being a problem. You cannot argue that point because you have not experienced it. And finally, you say you want the education system to go forward. I agree with you there. But you don't realize it is there in the county. I really don't think a new building will improve education in Cannon County. I don't think a middle school will improve it either. A nice new building would look great setting in the county seat, but does that make a good school...nope. All it does is give the county seat more centralized control of education and bragging rights for having a new school. That is what it amounts too. You have a new Grammar School in Woodbury. Wrap your arms around, embrace it, and leave the outlying county schools and Woodbury Grammar alone and let them educate the children in the county. As the saying goes if it ain't broke don't fix it. Well, I respect your opinion but I disagree with a pretty much all of it. Primarily because I don't think you have to be a teacher to understand that class room size is not the cure to better test scores. You can look up above and see the evidence to that. The average test scores across all six schools are not that far apart and from what I have been told by other teachers, some of the smaller schools have 11 to 15 students in a class. So again, I say that theory is hogwash. Your better argument would be to say smaller class sizes in schools that offer labs, arts, drama, etc. have better test scores. But, we can’t offer the same curriculum as other schools because we DON’T have the ability to. I am not sure how you say that we won't save money, considering if we spend $800,000 per school and you close three of them you have an automatic savings of $3.2 million dollars a year. And I don't think we spend that on transportation, so even if you subtracted $1 million for transportation, it is still a substantial savings. And we only have one High School and everyone seems to be able to get their child transported to it. Why would this be any different? Also, seeing the cosmetics of a school compared to the structural of a school is two totally different things. I have been to them all as well. I grew up here. I went to school in them. Most all have been converted from coal to electric or gas. All of the older schools have single pane windows and are cold in the winter and hot in the summer. Compare the electric bill from the one built in 1958 to the one built in 2002. I bet it isn't close. Compare the maintenance costs and I bet they aren’t close either. And to me this isn't about a pretty new school. This is about offering more classes, better facilities for special needs kids that CAN NOT be the given the same way from a school built in 1958. This is about better labs, better ability for kids to take a drama class or gym class every day and many more things. The idea of "if it ain't broke, don't fix it" is one that will doom you to failure. That is the mantra we have been living under for far too long in Woodbury. To me that is a terrible attitude to have about life and the problems we face. If we continue to follow your advice then we really should say "if it ain't broke, don't fix it because someone else will take care of it if it breaks". I for one do not want to hand this off to my daughter 10 years from now. There is a reason why the ant had food in the winter and the cricket did not. Corey, lets look at your figures for a sec. If you close three schools at $800,000 per school you will only save the school system $2.4 mil. (assuming it really was $800,000 per school). Now lets say you go and build a new middle school or even a new high school you will be looking at a cost of near $20 mil just for land and a building. Next you will have to furnish this building with all new state of the art equipment that will be outdated within five years. That includes your labs and drama programs that you desperately want. Sounds like a bargain to me. And I am sure the county commissioners will think that they are really receiving a bargain being put in the hole so many more million. I went to school here in this county as well and I am beginning to think by comments you make that people in the county over the years have not received a good education. Now that is hogwash!! I understand about wanting drama programs in schools. You already have them there. 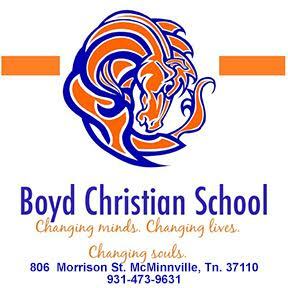 Have you ever supported the county schools in their Beta programs? Every year the county schools go to the state and national beta conventions and place very high in their drama skits and musical presentations. They win high honors over middle schools that are twice their size. What type of labs are you referring to? I am not real clear on that? I do know that all schools have computer labs with distance learning lab centers. If you are referring to science labs they are mainly used in high school for biology, chemistry, and physics. Middle schools currently do not offer those courses. About the heating and cooling cost. I agree that heating and cooling does cost. But new insulated windows in the schools would cost less to replace then building a new school. And the buildings are hot in the summer but for most of the summer kids are not in school. Most people that live in a house that was built back in the 50s and 60s don't go and build a new house, they update it and maintain it. You must not listen to Dave Ramsey? I would say if you called in and asked him which way would be more financially feasible he would probably say to forget building the new school and concentrate on maintaining what you already have. I stated before that Cannon County is not geographically feasible for a middle school and I am sticking to that. It isn't. I think you are looking at Murfreesboro and how they have structured their school system. I agree that they have built more middle schools and have made the outlying county schools K-5. They have had to do this because of so much growth. But if you look closely they have gone back to the community school concept. Look at the way they have positioned their schools. Kids are not bused across town to one central middle school anymore. They stay in their community and attend school K-12. Right now you need to utilize the resources you have with the community schools and forget about a centralized middle school because those are a thing of the past. Your statement when you say in reference to me that "you make that people in the county over the years have not received a good education" is far from the truth. I have been consistently defending you and teacher from implying that less students per class makes smarter students. Those were your words, not mine. The evidence is against you and her by the test scores. Building comes at a cost. Closing un-needed schools comes at a cost. Maintaining comes at a cost. The decision is which becomes more cost effective over the long haul. Your last statement really baffles me considering Murfreesboro and other surrounding counties are building middle schools EVERY YEAR. So if they are a "thing of the past" as you suggest apparently no one but you are living in the past. Murfreesboro has a better zoning program that is actually being enforced is the primary reason why you see kids staying in their communities. They actually have lotteries to determine which kids get into the middle schools. If you don't make it, then you go back to your community school. The waiting list is long trying to get in. So that theory of yours is also far from the truth. Geographically, Cannon is better suited for a middle school than Murfreesboro. The outlying schools we have were built in a time when there were less cars, buses and worse roads. They were built because parents couldn't drive that far or the rain soaked roads wouldn't let them get through. Today that is not the case. I understand you are against it. You seem to have a personal reason behind it vs. a logical reason to me. That's fine if that is the case, but the arguments you make are better suited toward building vs. not building. Like I said before, I am open to all suggestions and ideas with the exception of the one which you seem to think is plausible and that is to do nothing. Apathy is a dangerous thing to play with. You may think that doing nothing is the right move, to me that is why we are where we are today. Had this been done when you were a highschoolpro instead of a collegepro then we wouldn't be talking about it today would we? Well Corey I did a little research on the state education website on middle schools and how well they faired in meeting federal benchmarks for test scores. I looked at scores from 35 random middle schools across the state. Some of the middle schools were in the surrounding counties joining Cannon County. Out of the 35 middle schools 21 of them did not meet federal benchmarks. If my math is correct that is 60% that received failing grades for scores. Not good odds. Out of the 60%, 10% were in school improvement 1 and corrective action. That means that they are one step away from bringing in the state to run the school and the school having to create a school improvement plan. I have had to do one of those before and they are not fun for teachers. I also found that a great number of systems close to Cannon County do not have middle schools. I wonder why? These numbers are facts, not hogwash, taken straight from the 2010 State Report Card. I also looked at the federal benchmarks for Cannon County. All schools in the county met all federal benchmarks. That is something to be proud of. Also I did not say that smarter kids are in smaller schools. I stated that smaller classes tend to have better performing students on test scores. There is a difference there. I did find out one of the main motives for the middle school the other night at the county tournament. I spoke with people that felt the middle school was greatly needed to enhance the sports programs for the county. That will be another funding issue. How will the other elementary schools that remain open gain revenue when their ball teams are taken away? And the middle school games will never draw the crowds,community harmony, and revenue that the county tournament brought this past week. You will take that very important part of your county away with a middle school. Is that worth your middle school? If you look above, you will see what richstrength750 researched from the State of Tennessee as well. So, again I don't believe in the theory that smaller classes have smarter students or even do better on test scores. We have several schools in our county with small class sizes that aren’t doing a nickel’s worth of difference to a class with 26 in it. There are several things that make smarter students and drive better test scores and student ratio per class is very, very low on the list of reasons why. Primarily it begins at home with involved parents. It has more to do with how much emphasis is placed on their child’s education vs. TV, sports, dance class or whatever. That environment is the essential key to how well the child does in school. Then you get into the dedicated teachers who strive to make their class’s fun, exciting and educational at all times. Those are the ones who inspire students to learn, which promotes better test scores. Then you get into the school system, to include the individual school principal, the school board and the Director of Schools. And I haven't even begun to discuss the student themselves, which is another huge factor in itself. You could have 25 kids in one class or 15 kids in one class and it wouldn't matter a hill of beans if you didn't have what I described above. And sure there are counties around us who are like us with no middle school. This is tough times and people are struggling to find money in those places as well. And that is what this discussion is all about. MONEY. Pure and simple. I guarantee you all of those counties just like ours would jump at the chance to build a middle school if they had the money and land. And I could absolutely care less about how good our sports program would be with a middle school. I have one son in High School playing basketball now and I support him in every way I can. But, I have never and will never teach him sports are more important than his education. I have a daughter who will probably play in grammar school soon. But, I will never put any sports above her education either. Anyone who has the desire to build a middle school, high school or any school with the sole desire to see our sports programs flourish is missing the boat completely in my opinion. All I am asking is that we start planning. I am asking that we start looking for land. I am asking that we start studying the transportation issues, the re-zoning issues, the size of the school needed, etc. Doing nothing is not an option. And the longer we keep trying to do nothing, the more it will cost us in every way in the future. statically speaking (assuming all other variables are equal) the fewer students per teacher will increase productivity. don't think many will be convinced this theory is incorrect. Well statistically speaking (assuming the State of Tennessee is incorrect) then goober you are wrong. Scroll up. Look at the scores. Look at the research rich pulled from the web link http://www.tn.gov/education/reportcard/. You don’t have to believe me, you don’t have to believe rich, you don’t have to believe anyone, but you cannot deny what the State of Tennessee uses to determine reality. I don't think anyone who can see the evidence will be convinced that fewer students per teacher will increase productivity because it isn't happening now and we have several classes all over the county with 15-20 students. And as far as I know, there are no variables that are not equal throughout Cannon County Schools concerning the education of the students. And as I said before there isn't a nickel’s worth of difference in them all. The scores reflect the opposite to that argument for the last two years. Corey I want to wish you the best on trying to get your middle school. I hope it works for you. I did go back and look at the scores that rich had earlier. I also went on the state site to verify that they were correct, and they are. East Side, which is the smallest school in the county, was above state average in all areas. Woodbury Grammar School, the largest school in the county, was below state average in all areas. They are there in black and white. In terms of how educators look at those scores that is a BIG variance between the two schools. Again smaller class sizes provide more proficient test scores. I encourage you to call the State Department of Education in Nashville and pose the question to them about smaller classes providing better proficient test scores. NOT SMARTER STUDENTS but better proficient test scores. I have a feeling you will not get the answer you want to hear. I already know the answer and it won't please you. collegepro bad luck in your efforts to keep the county from getting any school. I don't hope it works out for you, because doing nothing is not an option anymore and I just hope that someday you will understand that this country wasn't built by people who chose to do nothing. I don't need to call the Department of Education; I will take your word that Eastside is above the State average. I will just let you believe that there is such a massive difference between the smaller schools vs. the bigger schools in Cannon County that we should never change anything we have ever done or prepare for the future in any way. I don't mean to sound sarcastic or hateful, but we have several schools that have small classes and your data that you are looking at just doesn't justify the way you are thinking when it comes to Cannon County holding on to six elementary schools when some are 50 plus years old. There just isn't enough difference between big vs. small educationally to justify it. And that is fact, not my opinion. I stated before that I have gone back and forth a little on the idea of a middle school. I am not sure that it is the absolute best route. As I have also said above, it could mean building a middle school; it could mean annexing on to WGS or building a new High School. I am not 100% sold on any idea. All I know for certain is that it is time to plan. It is time to look for land. It is time to do a study on re-zoning, transportation issues, cost analysis, etc. I don't have a feeling about this anymore, I KNOW you are not hearing the answer you want to hear. It is time for you and the rest of the county to put forth effort and work toward a solution to the future our children face by doing nothing. I hope that you lay aside your apathy and open your eyes to what is best over the long haul. I already know the answer to doing nothing and it isn't going to please you either. Corey, your comments just sound childish, and you just like to argue no matter what the topic is. You are showing how very little you know about the education system. Collegepro as well as others on here have valid points that you simply can't understand. You might want to consider another hobby. teacher your comments are very biased because you are more concerned about your own self and how this might affect you. That is evident in your postings. I really could care less what you think of me or my comments. I don't recall asking your opinion on either one. And I know as much about the education system as I need to know based on the State of Tennessee scores and data. Which, as I have stated before, contradict your comments completely. And regardless of what you say, I have done nothing but try to show you and others what shape we are in today and where we will be tomorrow if we follow your thought process and sit on our butts and do nothing. I am sure you would call that arguing considering you are not willing to look beyond your own self interests. For me personally, I benefit more by not doing anything. But, I am tired of the people like you who are determined to keep this county living in 1950. And more importantly, I am looking out for my children who are still in school and trying to keep from passing along a problem to them 10 years from now because folks like you are scared of change. You sit and complain. I will choose to work toward something better. Corey, I don't think you'll get your new building, (no $) but I think it's likely Woodbury and some other larger schools will get lots of new students from one or more schools being permanently closed. So much for the smaller class sizes that mean so much. The loss of one or more of our "old" schools will destroy the community connections that have been built, and many great teachers will lose positions. Does that sound like progress to you? And by the way, "teacher" who you referred to in your previous post will have the opportunity to find a job in Rutherford county making $10,000 more than he/she can earn here. I fail to understand how it would not be possible to save money by combining three small schools into one. Would it not cost two times more to divide Woodbury Grammar into three schools? As for differences in test scores, isn't a good portion of the discrepancy due to the variances in the percentage of economically challenged families? Well Corey you state that our county needs to get out of the 1950's. I will give you credit. By wanting to close schools and consolidate students into a middle school will push the county ahead 10 years to the 1960's. That is when consolidation of schools and the middle school concept was introduced. That is a gradual increase. But we are living in the 21st century where the key to good school systems is going away from consolidation. KevinHalpern had a good comment. That does account for differences in test scores. If you look at test scores most middle schools do not meet the benchmark for economically disadvantaged which causes those schools to not meet overall federal benchmarks. Central Middle School in Murfreesboro is a good example of what a centralized middle school can do. They could not meet the economically disadvantaged benchmark for three years and therefore was labeled a low performing school. Did they continue to keep that centralized middle school open? Nope! They converted the school into a magnet school. And they divided Central Middle School up in sections and dispersed those students to outlying middle schools. Why do we want to go back to the 1960's way of thinking with consolidation. And scrabble had a good point to. No money for a new building. Yes, whatever we do let's not think about the possibility of progress. Let's all keep the mentality of "if it ain't broke, don't fix it" like you have so wisely stated before. Then we could just drop this ball and dump it on someone else because we didn’t want to put forth any effort to make it better. And there were a lot of good things that came out of the 1960's to include men walking on the moon, civil rights and the march on Washington, the first heart transplant, to just name a few. "Ask not what your country can do for you, but what you can do for your country." By John F. Kennedy. Wouldn’t it be nice if both you and teacher understood the actual meaning of that statement and learned that life is not all about you and what benefits your life in the moment you are in? And finally, for the last time, please scroll up and read. I told you before I am not 100% sold on the idea of a middle school. I said it could mean many different things. A middle school is only one option of many. The primary goal is to not do nothing as you and her suggest. Nothing more, nothing less. I am still on the fence but I am sure the citizens of Woodbury would like the middle school or jr high concept alot better than those from Auburntown or Ivy Bluff. I do hope the decision makers will give fair consideration to all relevant and pertinent facts and data, insuring the best choice for all (tax payers, children, community and employees of ed. system). One aspect of our current system that I do like is our children only have to make one transfer from k to 12. The transition from one school to another can be traumatic on children, especially young children. If any two schools were combined Short Mountain and Eastside would probably cause the least hardship on their communities. I have a question for pro and teacher- Years ago I read some studies that supported k-12 at one location (or group of buildings at one location). The report said that it was not only economically efficient but a great social improvement for the students. This is probably not feasible for us but is that theory still in use and if so is there new information on its performance? Some of you think that a middle school is the answer. Some of you think that K-8th is the answer because that is what Cannon has had for about 60 years now. The most important part of a childs education is not bricks and mortar, but the educator who teaches them, the coach who coaches them, and the parents who raise them. We are missing an oppourtunity here by looking past teacher accountability! For example, look at our high school that has science labs and chorus classes and a stage that has more drama during pep rallies than theater performances. It takes good people in the right place to make a difference in our childrens lives. We need to recruit better teachers, who want to teach, into the county. Instead, we hire some of the left overs and people who can't cut it in other systems. Where is the data about instruction! What about more AP and higher level classes at our high school. What about more academically based clubs and organizations besides BETA who conducts talent shows and sing alongs. How about requireing service projects for 6th, 7th, and 8th graders. How about a 12 grade exit project required by the system and not the state! How about taking some responsiblity to education our own children and stop expecting public education to teach them everything about life. I love Cannon County, but cannont stand to see us squabble over an issue of bricks and mortar when no one wants to talk about the giant elephant in the room and that is the quality of instruction we are getting in our schools presently! This alos applies to people on our school board who have no business running a public good like that of education when they themselves are poor products of professionalism! That concept has been discussed at state education meetings I have attended due to the fact that test scores are now the key to a school being in good standing or low performing. I do know that Rutherford County, especially within the Murfreesboro area, is going away from consolidation and getting back to community type schools. If you look at places like Seigel, Oakland, Blackman those areas have their elementary, middle, and high school all there together. When I did my student teaching at Central Middle School around 20 years ago they were already discussing the need to make Central a Magnet School and go away from consolidation due to the fact that test scores were dropping and because of the number of economically disadvantaged students in that particular school. They had a plan to go back to community type schools to redistribute and balance the number of economically disadvantaged students. If you look at scores for most middle schools that are low performing you will find that they are unable to meet the economically disadvantaged benchmark. Studies do show that economically disadvantaged students show improvements in learning and success in learning in smaller learning communities. When you consolidate schools you lose out on getting to know a particular child, their family, and the needs of that child. In today's society that is very important. I have taught in two different middle schools during my career as a teacher and this is so true. I feel as a teacher that all students regardless of their economic status or disability should have a learning environment conducive to learning. By looking at the report card for Cannon County it seems right now that it has a good balance of students that are economically disadvantaged distributed throughout all the schools. I feel that if you start the consolidation process you will within two years see a drop in scores and schools being unable to meet federal benchmarks, especially in the area of economically disadvantaged. I will almost guarantee that will happen. And that is not fair to students, teachers, and parents. Some on this forum think that I am strictly against any kind of change. I am not against change. I would like what is best for all students. I have been in education for a number of years now and I know how the education system works. We sometimes try to build a product before reading the directions. I have heard through people who have attended these community meetings that this is already a done deal and will be implemented this fall in some form or fashion. So much for long range planning. I feel this should be at least a 5 year plan in order to implement this. Growth and feasibility studies need to be run to see what is best. If you fail to plan then you will plan to fail! I will do some research and see what I can come up with to further answer your question. Do you think spending $800,000 per year to keep a school open that is 50 years old and enrolls 116 students is a financially sound investment? Do you think spending $800,000 per year to keep a school open that is 56 years old and enrolls 146 students is a financially sound investment? Do you think spending $800,000 per year to keep a school open that is 30 years old and enrolls 142 students is a financially sound investment? Do you really think that we give them an education worth $6,722.68 per student each year at Eastside? Or one valued at $5,479.45 at Short Mountain? Or one valued at $5,633.80 at Auburntown? PER STUDENT mind you, EVERY YEAR. I don't understand that concept at all. I am not against any of the schools personally and I don't think we get the leftover teachers like deadeyedan2 implies. We have many good and dedicated teachers in this county and I am glad for every one of them. To me this has never been about the quality of education our teachers are giving. This is about the financial responsibility we have to ourselves and our children. It is about the idea of giving them a better environment, more available courses and stop living by sentimental concepts and start governing in reality. I am not blind to the understanding that there is no way we can continue to operate out of sentimental feelings of tradition because my daddy went to school at Woodland so my child needs to go there now. Or little Bobby needs to be at a community school where his best friend Johnny plays basketball even though they are not zoned to be in the same school. The idea that Murfreesboro has suddenly had a revelation and is deciding the need to go back to community schools is misrepresentation to say the least. #1. Look at the size of their county compared to ours. #2. Look at the population of their county compared to ours. #3. Look at the amount of money they can spend compared to ours. #4. Look at the need for more schools due to the size of the county and their population compared to ours. If anything that argument goes AGAINST the idea of community schools in Cannon County simply based on the financials and student enrollment of our county. What you are basically saying is that we need a school in Eastside because we have 116 students in that area. Or we need a school at Short Mountain because we have 146 students there. Surely, you can see how illogical that is. If you can convince the school board to give me the $5000.00 per year or more it spends on EACH student by keeping those small schools open, I will gladly take it and enroll my daughter into a private school. Until then, no matter what you research will prove that doing nothing is a good idea. Corey, I have been looking at all the comments from you and others and I have a few questions. Just curious. I am a native of Cannon County and Auburntown and even though I do not reside there I still have family who lives there, pays land taxes there and wheel taxes, and Auburntown will always be home to me. I have noticed that you are talking about buildings and their ages and Auburntown is one of the newer buildings in the county. I will admit I am not for closing any schools but why do you always refer to just three specific schools being closed? I know that there are two other schools besides the ones you have mentioned older then Auburntown. If it is because of their low enrollment then rezoning could take care of that. From what I understand the enrollment at Westside has also dropped somewhat. Is this true? When I lived in Cannon County a few years ago I was asked and served on a education study council to look at the possibilty of constructing a middle school compared to rezoning. I do know that their were zoning problems then and I say there still are. We never reached an agreement on really what to do but I do know that there was planning going on as to an economical way to serve the schools best. Plus if you do possibly close the three schools you mentioned what is your plan when the economy picks back up again and growth begins to come into the county. I do know that at one time Auburntown was running enrollments of around 150 students. That is not large but it was an increase over what it is right now. And when I served on that education committee if my memory is correct I believe that Short Mountain was up to around 180 at one time? And I would say that if the economy had not hit rock bottom that enrollment would have gone higher at all the schools. It was also projected in a study back in 2008 that in 10 years the city limits of Murfreesboro would extend out to the Milton area and growth would come to the Auburntown area. Growth is coming to all areas of the county, not just Auburntown. And I agree with you we need to plan. But if the county does close schools right now they will probably sell the schools and the land.... then what? What will you do when the growth comes again (and it will) and you have put a limit on the schools to catch this growth because they are all closed and land is gone. It is somewhat of a gamble because growth is coming but you are not sure when and how much. After you close schools, in five or ten years, when growth does come, do you go out and buy land and build schools again? Is that economically good? I understand your figures and you say you want to do what is best economically for the county. But why do you suggest closing a school that is 33 years old with land around it to add on for future growth and leave two schools open that are 53 and 56 years old. (Look above to see the schools) I remember from the education study council with rezoning the enrollment for Auburntown would increase if done the right way. Students from the western part of the county could be redistributed to Auburntown and Woodbury Elementary. I was not necessarily for that because it would have eliminated one school. I would not like to see anyone lose their school, but since you have really stressed in your comments about the age of buildings and the upkeep on old buildings it would make good economic sense to leave your newer schools alone. Less maintenance, better efficency, and cost effectiveness is what you have stated you wanted. I believe I could get more of that from a 33 years old building then a 53 year old building. Plus that 33 year old building can right now accomadate 250 students as is and their is land around it to add on if needed. Now which way is the best way to save money? I use those three specific schools due to their current enrollment and the cost per student we spend on 116, 142 and 146 students respectively. And also because two of the three (Eastside and Short Mountain) are 56 and 58 years old. I use them for no other reason than those. I am not advocating closing any specific school. That is for the board to decide in my opinion. To be honest, as I have said before I don't think it is possible to close all of them because we have approximately 928 K-5 students in the county. We couldn't build a middle school to hold that many, so some of the schools would have to be kept open for the time being. That is why I am not 100% sold on the idea of a middle school. It could mean a new High School or annexing on to WGS. I think when you really planned this out, the better idea would be to look at the capacity of each school, the age of each school and the loaction / re-zoning for each school to make the determination to close one, two, three or whatever number is decided upon. In the end that would save the county money. I say it almost every time I comment. My goal is to give the people who read these comments a better understanding of what we face, how much it is currently costing us and what we will face 10 years from now by doing nothing. I believe the time to act is now. Waiting, doing nothing, and living in a sentimental dream world and making decisions based on how my daddy did it 30 years ago or how it affects the sports program is a ludicrous and shameful attitude to a problem that will only get worse. Doing nothing is not an option. We must build and we must do it soon. The other problems will begin to work themselves out after we get that one decision into our collective minds. Exactly. Don’t put it off. Make some choices. But first, PLAN. Do not "throw" this middle school together. PLAN. Act NOW by PLANNING and doing it right in 2, 3...or how ever many years it takes to do it RIGHT. Have a realistic goal of when these things can happen- not thrown together for the sake of having a middle school. Don't make changes that do not improve the budget shortfall or student academics. If the decision is made in favor of a middle school, then make it the "ideal" middle school as described in the forum presentation. It must offer MORE- more than art, PE, and music because those are already offered. How can MORE be offered in the middle of a budget crisis at this point? I am not against change. I am against making changes that "patch" problems. PLAN NOW. PLAN for the FUTURE. Make decisions NOW, but don't throw it together and make drastic decisions that could be devastating to communities unless NECESSARY. Some have mentioned shutting down schools based on age. If that is the case then most all of them would be shut- old buildings with new additions that won’t be paid off for another 7 years. Just say consolidation based on saving money- not age. If there are options on the forum PowerPoint that realistically can’t be done then they should be removed. It has been said that “no change” is really not an option because of budget. Take it off the option list. If building a new school is not realistic because of money then it should be removed as well. Don’t get hopes up that we will have a grand new building with all the amenities, extra elective classes, and extra sports if that is not indeed going to be the case. Those who support a middle school would be gravely disappointed to find their child sitting in a tiny classroom of 35 students at WGS with nothing MORE offered. Let's get down to what our actual realistic options are- whether we like them or not- and discuss them and make a decision from those. If the options were narrowed maybe a bit more detail could be given which would make people more informed therefore more confident. It has been said that a school system needs to be run like a business. I agree with that when dealing with finances. And that sometimes means making tough decisions that everyone will not agree with. But much of the general public is not going to understand all the budgeting issues of a school system. But the fact is we ARE dealing with children and their families and people’s livelihoods. That is what schools are- children and their families. It is our human nature to protect our own families. To negate people's emotions and ideas because you don’t agree will only turn people away. I am really upset and surprised how these discussions have led to teachers turning against teachers (at public forums), neighbor against neighbor, and friends badmouthing friends all because they have differing opinions. It seems as if everyone wants to place blame on someone else. In this day and age there are not a lot of guarantees about anything so protecting something as important your children and family is always at the top of the list. People form opinions based on their experiences and we all have different ones. It doesn’t make one right or wrong. I pray when all this ends our county is not completely divided against each other and we are on a path that will benefit ALL students. I want nothing more to come out of this than the education of our community on what we are dealing with financially and most importantly educationally for our children now and in the future. This is not an overnight process. I agree with you in that we should plan it, re-plan it and then plan it some more. I can't help some people have more problems facing reality than others, but I am sick to death of everyone trying to hold on to the past in an ever changing world. When we get down to the final decision we must move forward and stop looking back. There is nothing any of us can do about yesterday, but we are foolish if we don't plan for tomorrow. I haven't located your question about k-12 buildings being more energy efficent yet, but I did find out some interesting studies on middle schools compared to k-8 schools from other states. Studies have been administered, and students have been tracked, over a 10 year period on middle schools and K-8 schools. The findings have shown that students attending middle schools show a substantial drop in test scores in Math and English compared to students attending traditional K-8 schools. The study also showed an increase in absenteeism and increased discipline problems for middle school students compared to K-8 school students. It also showed that students attending middle schools have a decrease in motivation and develop negative attitudes toward learning compared to students in K-8 schools. An additional study showed that some states are going back to smaller schools to help improve test scores on standardized test. Some of the school systems are wanting to put limits on schools having no more than 400 students in each school. They found that smaller learning communities perform better on test scores. It sounds like even though the county is in the past it actually may be in the right direction for the future. Who knows for sure? I will continue to search for your answer. It makes a lot of sense if you stop to think about it. It is hard to put a test score on social abilities which are as important, if not more important, than intellect.